In September–October 2014, a salvage excavation was conducted in Ramat Bet Shemesh, Neighborhood D (Permit No. A-7216; map ref. 197577–93/623095–110), prior to construction. 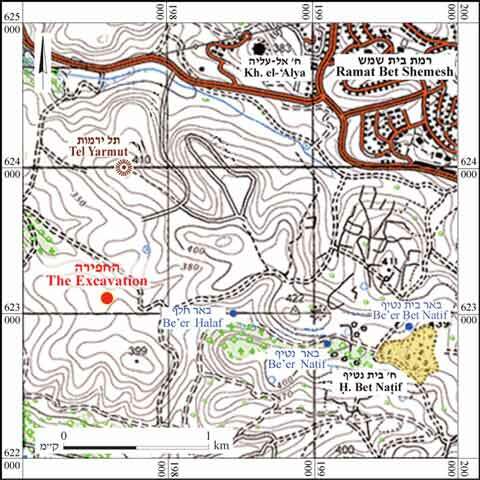 The excavation, underwritten on behalf of the Israel Antiquities Authority and financed by the Ministry of Housing and Construction, was directed by I. Radashkovsky, with the assistance of N. Nahama and R. Abu Halaf (administration), M. Kunin, V. Essman and M. Kahan (surveying and drafting), A. Peretz (field photography), B. Touri (safety), A Zilberbod and D. Ben-Ami (consultation), N. Zak (plans), and S. Gendler, Y. Tsur and O. Shalev. A lime kiln (Figs. 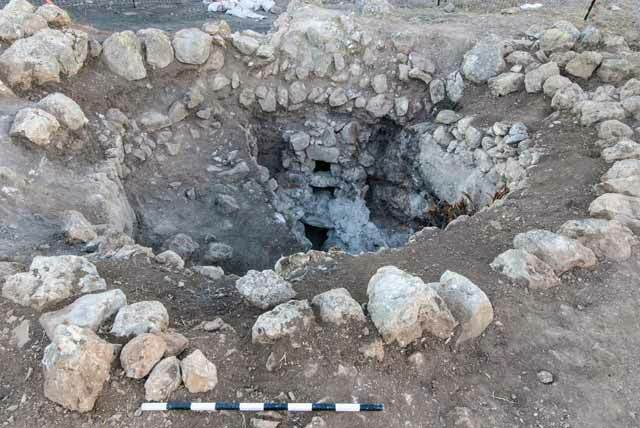 1–3) that probably dates from the Ottoman period was excavated on the northern slope of a small hill, south of Tel Yarmut. The installation was documented in an extensive survey undertaken in the past (Dagan 2010). Similar kilns were previously excavated nearby (Storchan 2012). The area was surveyed extensively in the past (Dagan 2010). 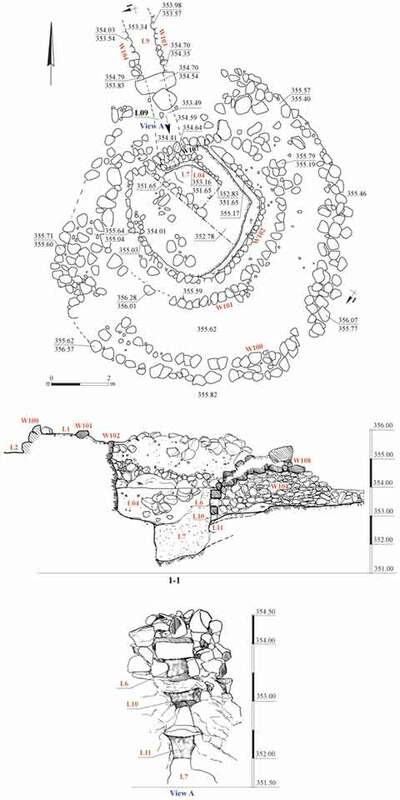 The kiln consisted of a circular firebox (L4), a ventilation channel (L9) and two curved walls (W100, W101) that apparently supported the ceiling of the kiln, which was not preserved. The firebox was rock hewn (diam. 4.2 m, depth 3.05 m). Its walls were straight and became slightly wider toward the top; its floor was leveled. The wall of the firebox was treated with plaster. 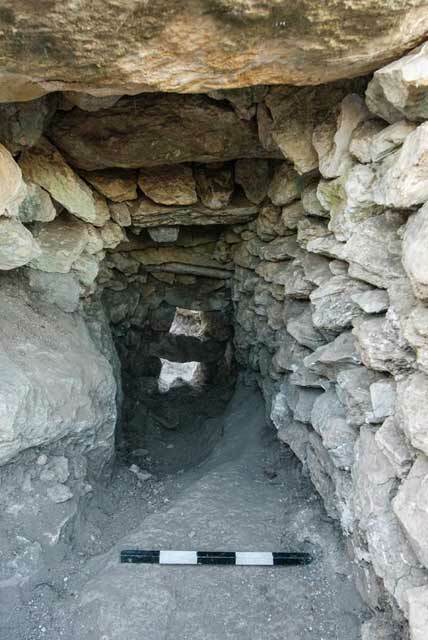 Several cavities were breached in the wall, as a result of the natural weathering of the bedrock, the kiln’s fire and damage caused by the roots of trees. 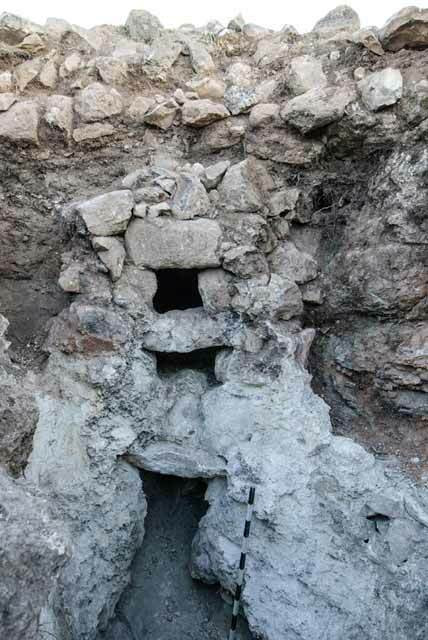 A layer of accumulated lime (L7; thickness 1.1 m) was found on the kiln’s floor. A wall (W107; length 1.5 m, width 0.3 m, height 1.18–1.51 m) aligned in a southwest–northeast direction that curved to the southeast was exposed on the northern side of the firebox. It was constructed of small stones and had a layer of lime and ash adhering to it. It was part of the firebox, but was damaged by the tree roots. The hewn wall of the firebox was raised with a built wall (W102; max. width 0.4 m, height c. 1 m) that ran along the entire top of the bedrock wall. Wall 102 consisted of a row of poorly preserved small and medium-sized stones bonded with mortar. The ventilation channel (length 5.4 m, max. height 1.1 m) led into the firebox from the north. Its lower part was hewn, and its upper part was built of two parallel walls (W103, W104). Walls 103 and 104 were built of stones of various sizes, with small stones and mortar inserted in between. The southern parts of these walls were in a better state of preservation, surviving up to the height of eight courses. Eight large stone slabs that covered the channel (L108; 0.60 × 1.33 m, thickness 0.16–0.21 m; Fig. 4) were placed over the walls. The slabs were arranged alongside each other, and the gaps between them were sealed with small stones. The northern part of the channel covering was not preserved. The opening of the channel onto the firebox was divided into three parts (L6 – 0.25 × 0.32 m; L10 – 0.21 ×0.36 m; L11 – 0.45 × 0.70 m; Figs. 5, 6) set vertically, one atop the other, and separated by large stones. This division ensured a better flow of air into the firebox. The two lower openings (L10 and L11) were mostly clogged with lime. Walls 100 and 101, which enclosed the firebox, were built of various-sized stones bonded with mortar and soil. The walls were poorly preserved, having survived to a height of one or two courses. It seems that the walls were used to support the base of a dome-like covering above the firebox. The covering was probably constructed of stone layers. Once the lime was produced, the covering was dismantled in order to remove the lime. The stones used to build the covering were probably meant to be burnt and were discarded inside the installation; hence they were not preserved (Weksler-Bdolah 2005). 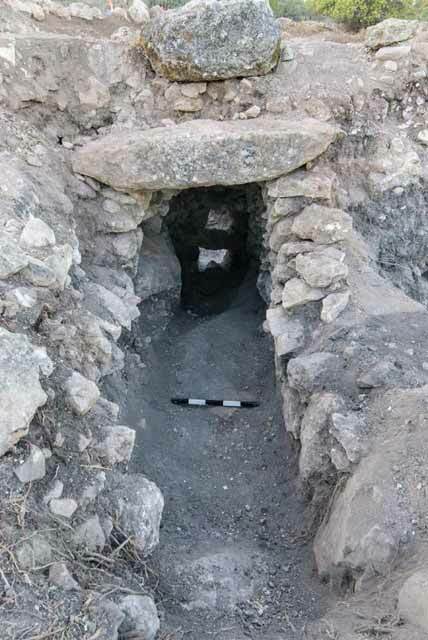 No datable artifacts were discovered in the excavated kiln, but the construction and plan of the installation were similar to those of the lime kilns previously found nearby; these were dated to the Ottoman period. The numerous kilns that were exposed in the area indicate that an extensive lime industry existed during this period. Storchan B. 2012. Bet Shemesh, Ramat Bet Shemesh (C). HA-ESI 124. Weksler-Bdolah S. 2005. Modi‘in (B). HA-ESI 117. 3. Lime kiln, looking north. 4. The ventilation channel and the covering, looking south. 5. The opening of the kiln’s ventilation channel, looking north. 6. The ventilation channel, looking south.